The First Judicial District Commission on Judicial Performance unanimously recommends that Judge Thomas Vance BE RETAINED. 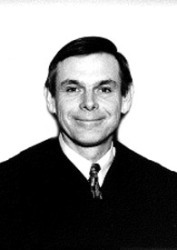 Judge Vance was appointed to the Jefferson County Court in July, 2004. Prior to his appointment, he served for 10 years as a Jefferson County Court Magistrate. He received a BA in Economics from the University of Denver and earned his law degree from the University of Denver Law School. Judge Vance is very active in the local community as a sports coach. In addition, he conducts mock trial judging and attends small claims court with high school students. He feels it is important to be out in the community and to stay in touch with those he serves. He has been an integral part of the formation and implementation of the new Bail Reform Program. The Bail Reform Program focuses on being a more evidence-based practice and having more pre-trial supervision. Judge Vance is seen as fair by both attorneys and non-attorneys. Jurors are put at ease and are comfortable in his courtroom. He is perceived as a judge who gives consistent and appropriate sentences. His great judicial demeanor was repeatedly mentioned by the surveyed attorneys. Survey results by attorneys and non-attorneys rated him above average with regard to his diligence, courtroom demeanor, communication skills and case management. Of attorneys responding to the survey, 89% recommended to retain, 7% recommended not to retain, and 4% made no recommendation regarding retention. Of the non-attorneys responding to the survey, 87% recommended to retain, 6% not to retain, and 6% made no recommendation regarding retention. The Commission interviewed and conducted courtroom observations of Judge Vance. In his interview it was noted that some of his cases remain open longer than usual. He attributes this to making sure that pro se defendants have the opportunity to appear with counsel and to working with unprepared parties. Judge Vance endeavors to be respectful of people’s time while affording a fair opportunity for all to be heard. He was found to be welcoming, respectful, and helpful to all in his courtroom. He exhibits openness and active listening skills. He explains his rulings and makes sure all have a clear understanding of the sentences. Judge Vance embraces the role of servant in the community. Based on these findings the Commission unanimously recommends Judge Vance BE RETAINED.